The Dubai Miracle Garden (In Arabic: حديقة الزهور بدبي) is a flower garden located in the district of Dubailand, Dubai, United Arab Emirates. The garden was launched on Valentine's Day in 2013. The garden occupies over 72,000 square metres (780,000 sq ft), making it the world's largest natural flower garden featuring over 50 million flowers and 250 million plants.In April 2015, the garden was awarded the Moselle Award for New Garden Experiences of the year by the Garden Tourism Award 2015. Nice garden a must visit place in Dubai. Love each and everything here. We had been in Feb 14 Valentine's day it was worth going. Need to talk more and need least 3 to 4 hours if u need to take pics. Else 2 to 3 hours is sufficient. Take public taxi which u will get near exit to save money than what they offer. The first thing that surprised me was the garden aspect of it all. How did DUBAI, a desert, cultivate so much greenery? It was impressive. But the more I walked in, the more awestruck I was. The place was beautiful. Really beautiful. The carvings -- from animals to fruits to Mickey Mouse to lord knows what -- were spectacular. It was really hot though. The place needs more shady areas but my, what a pretty place! Absolutely loved this place! Great for families and people of all ages. 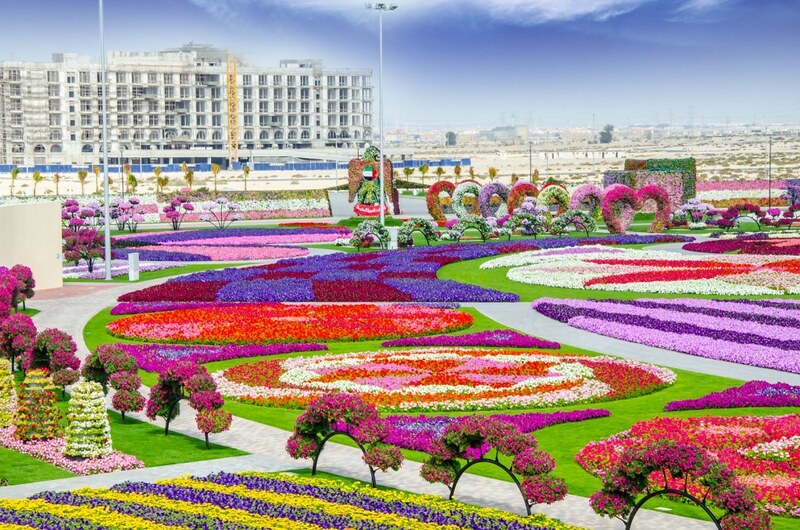 Miracle Garden is one of the best tourist destinations in Dubai. This garden is open for people for 4 months every year during winters Cartoon and plane structures built and decorated with colorful flowers. You can take good pictures from deck beautifully built and decorated with flowers and A380 structure covered in emirates color flowers. Food options are limited to corn, tea, ice creams. Known for its scenic beauty, this place is truly magical. It has amazing structures all made out of flowers. It has very relaxing and soothing touch to it. Feels amazing to be surrounded by this plethora of flowers of varieties. Had a great time here. It's a must visit. You'll regret missing it. A true miracle indeed. Simply awesome place 😊 The garden is very creatively built up. A good place for photography and also to spend quality time with your family. It's worth visiting once. Only thing is you need to wait for longer time outside to get the bigger taxis as very few of them come their for pickups. Overall, had a great time !